SASLA has lined up an exclusive tour of a new rooftop garden at historic Fenway Park! 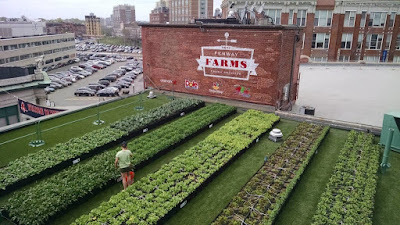 The small rooftop garden known as Fenway Farms is sits quietly behind the classic Fenway Park sign atop Gate A. The 7,000 sq. foot garden farm will provide a rotating array of freshly grown herb and vegetables for use on salads and other EMC Club menu items. The garden is part of the ongoing Red Sox’s campaign to promote a healthy way of life and support local sustainability efforts. Recover Green Roof spearheaded the project’s construction and design, while Green City Growers handles maintenance for the garden. Fenway Farms will also serve as a resource to teach local kids about the benefits of healthy eating habits and sustainability. This exclusive tour will be limited to fifteen BAC community members, and ticket’s are $10. Also bee sure to attend SASLA's First Friday right after the tour starting at 6pm!